Rock scrambling offers the chance to move through steep, rocky terrain without the need for rock climbing equipment. This means we move quicker, cover more ground, and improve our skills with each step. The situations are often steep and the views always superb. It’s a great adventure for all with plenty of challenge whatever your current ability. For high grade, difficult rock scrambles, we use ropes. This would be borderline rock climbing terrain. For some sections of this type of terrain we may revert to using rock climbing systems, and for the more straightforward sections we scramble freely. This makes for a challenging, satisfying, and fun day out. Will it be tiring, yes most likely! 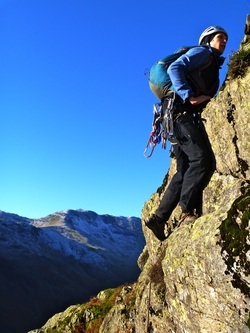 Half or full day scrambles can be arranged and will involve one or more scrambling ascents of Lake District mountains. Our aim will be to use easy to reach scrambling terrain in the Langdale & Coniston valleys, near to Ambleside & Windermere. We focus on getting plenty of time on rock whilst moving through the mountains in a variety of settings. Tarn Crag - Langdale: This crag has multiple scrambles from grade 1 - 3 and a few easier grade rock climbs. The position is impressive and the rock is typically high quality Borrowdale volcanic. Pavey Ark - Langdale: Jacks Rake is the 'classic' scramble to the summit of this mountain and an absolute gem. Positive holds the whole way, amazing scenery, and views that really are very hard to surpass. Harrison Stickle - Langdale: A good one on busy days when many will be ascending Jacks Rake, this little known place will likely be quiet. The rock is superb and the route has an adventurous feel to it. The rock only finishes at the summit of the mountain, how good is that. Ill Crag - Eskdale: This is most easily reached from Langdale via Esk Hause and is a big day out high above The Great Moss of Eskdale. The scrambling is good on Borrowdale volcanic rock, so nice and rough with good grip. We finish by topping out onto the summit of Ill Crag, awesome. Raven Crag - Langdale: There's a few possibilities here, with a good grade 2 at the right hand end of the main crag followed by lots of grade 1 above in order to reach the higher Langdale scrambles. Or there's Middlefell Buttress to the left of the main crag, this is an easy rock climb (diff) that is justifiably popular. From the top we can either abseil back down, or continue with easier scrambling up to Thorn crag and beyond. Pinnacle Ridge - Patterdale: The photogenic 'Alpinesque' ridge is a rewarding day out in the mountains above Ullswater. At grade 3 this is the top end of the scrambling spectrum and there are many exciting positions to be enjoyed on this one. The Helvellyn range provides perfect scenery for when you want to have a look around. Scafell - Wasdale: Broad Stand which rumour has it that Coleridge descended from the summit of Scafell to gain Mickledore and thus stumbled upon the route. Looking up from Mickledore, the line of ascend / descent wouldn't have been obvious back then, but now it's a little easier to distinguish although still not completely obvious. The route is challenging way beyond it's grade 3 status suggests. As a way to the summit of Scafell it's well worth seeking out and above the initial difficulties things get much easier but still in most impressive scenery. 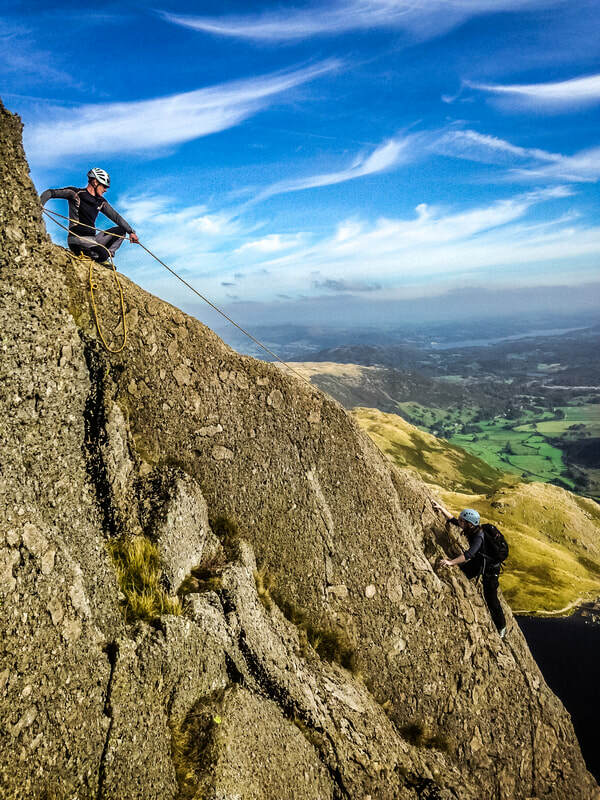 Pike 'O Blisco - Langdale: The finest rock in the Lake District can be found here, it's super grippy and solid, providing enjoyable scrambling for beginners or seasoned scramblers alike. It's a big favourite of ours because there's amazing views, easy access, and so much fantastic rock. Harter Fell - Dunnerdale: Hiding in this quiet backwater, Harter Fell provides some fine scrambling opportunities and we can show you many of these. If you're looking to enjoy scrambling in seclusion, this is the place to aim for, and with great rock outcrops all the way to the summit, there's plenty of interest the whole way. Long Crag - Coniston: This fine ridge lies just above the village of Coniston. Lots of quality rock allows height to be gained easily, giving increasingly good views to Coniston Water. You may already have an idea as to what you would like to do and where. A specific route in mind maybe. Or are you walking all the Nuttalls or Birketts and wish to scale Pillar Rock? This is at the very top limit of what we would call scrambling and is included in the current rock climbing guides to the area. A rope is essential for an ascent & descent of Pillar Rock. Whilst the scrambling / climbing is never too difficult, the steepness and exposure are severe! A day out to remember. All offer the finest scrambling terrain in Lakeland.